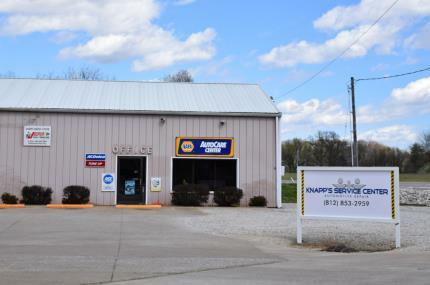 Knapp's Service Center is a fully equipped automotive maintenance and repair facility located in Newburgh Indiana. We have been doing business in Newburgh since 1971 and have been at the present location at Highway 66 and Outer Lincoln Ave since 1977. We employ highly skilled technicians, most of whom have been with us for many years and are equipped to handle most of your automotive needs from Full Service Oil Changes to Computer Diagnostics to Engine and Transmission replacement. Some of our many services include Wheel Alignment, Shocks and Struts, Tires, Fuel Injection Service, Tune Up, Belts and Hoses, Cooling System Service and many other services to keep your vehicle in tip top shape. Most of all we know that our continued success relies on the satisfaction of you, the customer, so give us a try. We will do our best to make you glad that you did! Click here to view informative videos about automotive repair and maintenance on our "Tips" page. See us for all of your automotive needs!